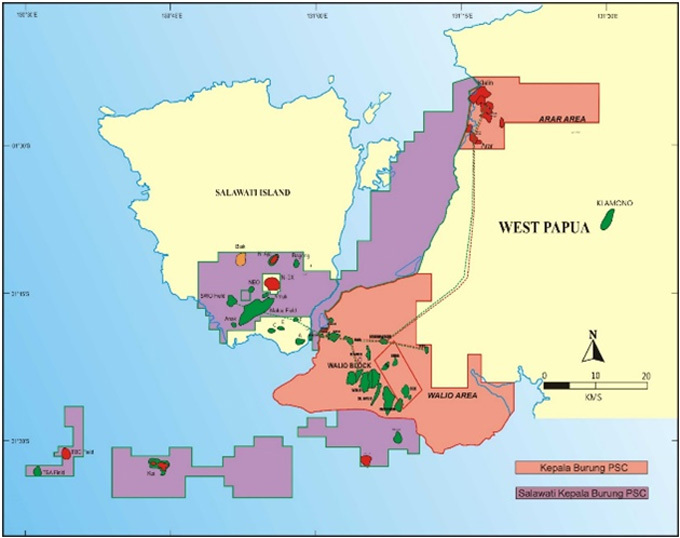 The Kepala Burung PSC ("Basin PSC") and the Salawati Kepala Burung PSC ("Island PSC") are two contiguous blocks located in the &apos;Birds Head&apos; area of West Papua, Indonesia and are the Group&apos;s key producing assets. Basin PSC covers an onshore area of 872 km2, while Island PSC covers an area of 1,097 km2 which straddles both on and offshore. Both blocks lie within the Salawati basin, which is one of the most prolific petroleum basins in Indonesia. The Group holds an aggregate of 60% working interest in the Basin PSC. The other partners in the block are PetroChina and Pertamina. The Group entered the block in 2010 as a non-operating partner and in 2016, the Group took over the operatorship of the PSC. Being operator of the block enables the Group to better control and manage the operations and performance of the block, and support the Group&apos;s plan to grow and expand its businesses in Indonesia. Drilling activity in the Basin PSC began in 1972 which resulted in 20 oil and gas discoveries from the Miocene aged Kais Formation, a fractured carbonate with strong aquifer support. To date, cumulative production from the block has exceeded 350 million barrels of oil and 250 billion cubic feet of gas. Currently, the Basin PSC produces from 18 active oil and gas fields, with the largest contributor being the Walio oil field which accounts for more than 50% of the block&apos;s oil production. In recent years, production level has remained relatively steady through an on-going program of well optimization and workovers, supplemented by near field exploration discoveries and in-fill development drillings. The Basin PSC owns and operates the Kasim Marine Terminal ("KMT"), where crude oil produced is treated and stored before it is lifted by the respective Basin PSC partners. KMT has the pipeline facilities to deliver crude oil from its storage tanks to the adjacent refinery owned by Pertamina, as well as loading pier and facilities for loading crude oil onto tankers for both the domestic and export markets. Besides being used for Basin PSC&apos;s own production, KMT also stores and throughput oil produced from 5 neighbouring blocks through various facility sharing arrangements. Crude oils from the various blocks are integrated and sold as Walio Mix crude blend. The Basin PSC was awarded in October 1970 for a 30-year term and was later extended for a further 20 years, with the current term expiring on 15 October 2020. In July 2018, the Group signed a new Kepala Burung PSC covering an enlarged area of around 1,030 km2 (the "New Basin PSC"). The New Basin PSC is for a 20-year period and will come into effect when the current Basin PSC expires in October 2020. 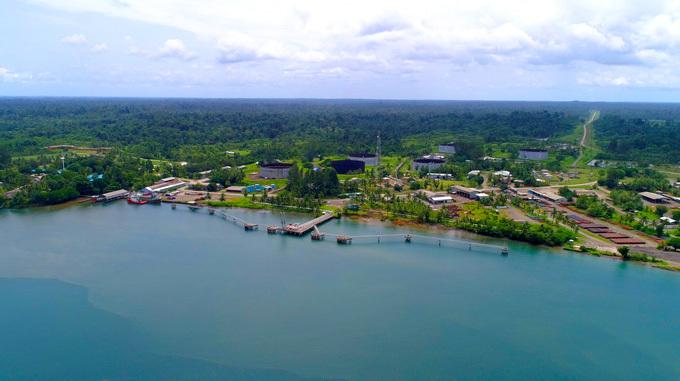 The Group holds a 70% working interest and will continue to be operator in the New Basin PSC, with Pertamina holding the remaining 30% working interest. With the award of the New Basin PSC, the Group is well positioned to review and implement longer term initiatives to increase production from existing fields, such as through in-fill development drillings, EOR and other production optimization plans. More importantly, the Group will be able to refocus its efforts on the large inventory of exploration prospects that remain within the block. Any exploration success has the potential to tie-back to existing infrastructure and move into development and production quickly. For the latest update on the Basin PSC, please refer to our latest corporate presentation. The Group is a non-operating partner in the Island PSC with a 33.2% working interest. The other partners in the block are PetroChina and Pertamina, which jointly operates the block through a joint operating body. Similar to the Basin PSC, the Island block produces from the Miocene aged carbonates. Oil produced from its onshore fields is barged to KMT where it is mingled and stored with oil production from Basin and other fields and sold as Walio Mix crude blend. In the offshore area, the Island block currently produces from the TBA oil field which is a standalone development comprising an unmanned platform tied to a leased FPSO. The Island PSC was awarded in April 1990 for a 30-year term and will be expiring on 22 April 2020. In July 2018, the Group signed a new Salawati PSC covering an area of around 1,137 km2 which includes essentially the entire existing acreage of the Island PSC (the "Salawati PSC"). The Salawati PSC is awarded for a 20-year period and will come into effect when the current Island PSC expires in April 2020. The Group holds a 70% working interest and will assume operatorship of the new Salawati PSC, with Pertamina holding the remaining 30% working interest. As operator for both the New Basin PSC and Salawati PSC, the Group will be better able to optimize and extract operational and cost synergies between the two adjoining blocks. There remain a number of undeveloped discoveries and drill ready prospects in the Island block, especially in the offshore areas, which offer significant growth potential for the Group. These include the discovered TBC and North Sele gas fields which have a combined contingent resource of up to 20.7 million barrels of oil and 444.9 billion cubic feet of gas. For the latest update on the Island PSC, please refer to our latest corporate presentation.